KidStart Magazine > Family Life > Holidays & days out > Win 1 of 2 pairs of annual passes to Chessington World of Adventures Resort! 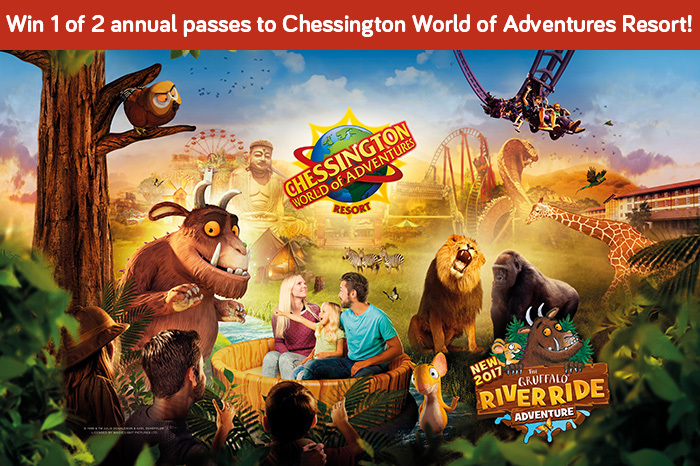 Win 1 of 2 pairs of annual passes to Chessington World of Adventures Resort! 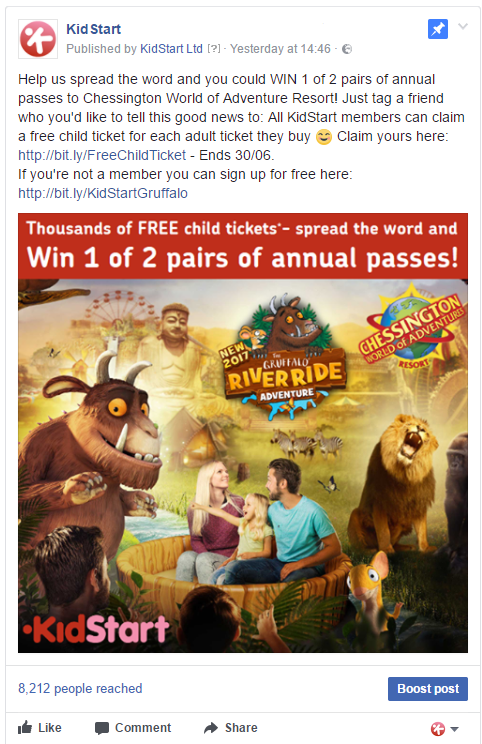 We’re sure you know that KidStart have teamed up with Chessington World of Adventures Resort to offer our members an exclusive Kids Go Free offer, to celebrate the launch of their new Gruffalo ride. If you didn’t… where have you been hiding? It’s now got better. Not only can you get your hands on a free child’s ticket*, we are now running a fab competition where you can win 1 of 2 pairs of annual passes to the theme park! All you have to do to be in with a chance of winning one of these tickets, is to help us spread the word about this competition by tagging a friend on the post below that’s pinned to the top of our Facebook page. If you miss out on one of these tickets, don’t worry, as mentioned above all KidStart members can claim a free child’s ticket for every full price adult ticket bought*. If you’re not a member you can sign up for free and get your free ticket by accessing your unique code (two free tickets per code). Not sure what KidStart is? KidStart is a FREE shopping club for parents that helps you save for your little ones by giving you a percentage back of what you spend when used to do your online shopping (and some in-store retailers too). We work with over 1,500 top brands including John Lewis, Amazon, Morrisons and ebay, making it an easy to top up your children’s savings account. The Chessington World of Adventures Resort competition ends 30th June so don’t miss out. Get tagging! Please check full T&Cs here.